1. Mix the flour, sugar, yeast and salt in a deep container. Add 2 tbsp olive oil, water and knead elastic non-sticky dough. 2. Place dough in a greased with a thin layer of oil bowl and cover with a damp towel then leave in a warm place for several hours (the dough should increase in volume by 1.5-2 times). 3. On work surface sprinkled with flour, lay out the risen dough and divide it into 6-7 equal parts. Each part will twist into a sausage, then connect the edges and tightly (so the result is a ring). 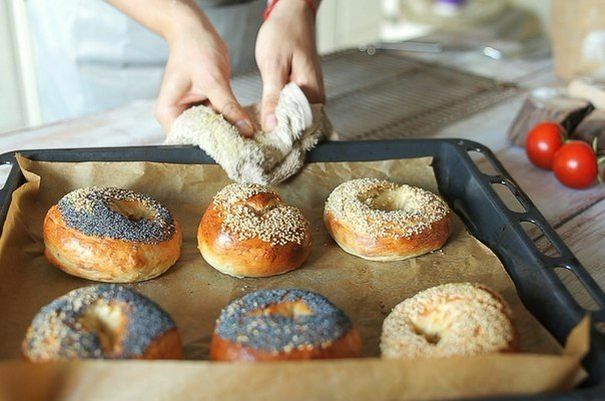 Again cover the bagels with a towel and leave for 20 minutes. 4. In a large saucepan (3-4 liters) boil water adding 1-2 tablespoons (or to taste) of honey. Drop bagels in boiling water for 30 seconds, then flip with a slotted spoon to the other side and soak for another 30 seconds. Remove bagels with a slotted spoon and place on paper towel, leave on for a few seconds to dry. 5. The dried bagels dip into toppings and place on parchment covered baking sheet. Bake bagels in preheated 220 °C oven until Golden brown. The finished cakes allow to cool on a wire rack. 6. Cut the vegetables and the fish in small slices. The cooled bagels, cut lengthwise, and serve with cheese, vegetables and salmon (salmon). Optionally, you can dry bagels in the toaster or on the grill.